5 Years of Suspension Wiped Away In One Month • License Restoration Services, Inc. Client “C” came to me with almost 5 years of license suspension in Pennsylvania. His driving record was a mess with old tickets from all over. Things did not sound good at first, but after our investigation we found a PennDOt error that needed to be fixed. Years of experience was used to determine that the error occured when PennDOT calculated the suspension time. 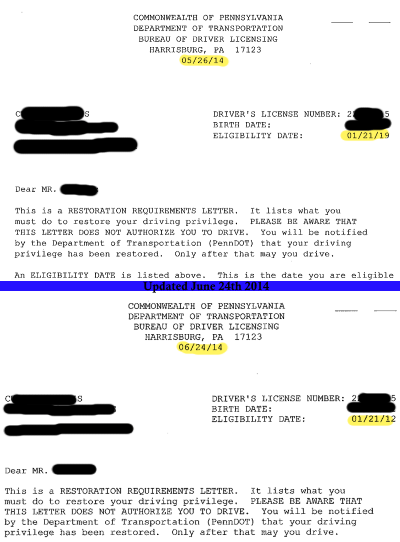 At first PennDOT was reluctant to correct the error because the calculation of suspension time and credit date seemed correct, but after a careful petition was submitted, the eligibility date was changed so “C” was able to get his license back within a month rather than 2019.
Credit for the suspension was granted, and the new eligibility date is 01/21/2012 – I only wish “C” had contacted me 2 years sooner!